Hey, Look! I found a good use for canned cranberry sauce!! P.S. Please don't ask me what I was doing with a can of that jellied cranberry sauce. 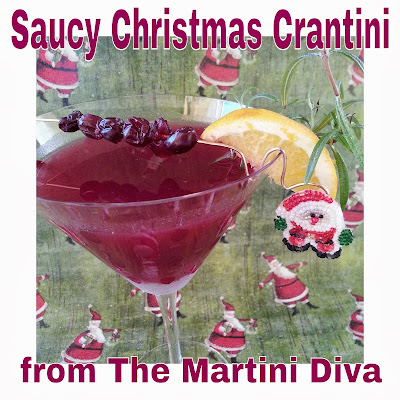 Make your Rosemary Infused Cranberry Syrup* by dissolving a cup of cranberry sauce in a saucepan with 1/2 cup of water. Pinch the rosemary leaves between your fingers to release the oils and drop in. Reduce on medium until the syrup is the consistency of maple syrup. Strain into a container and chill. Chill your martini glass in the freezer. Stir until well mixed and chilled then pour into your chilled glass. Garnish with the gin soaked cranberries, rosemary sprig and orange slice.